Click the button below to add the Torchmate 4x4 CNC Plasma System to your wish list. 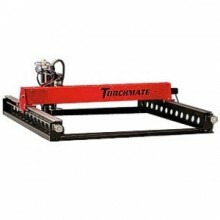 The Torchmate 4 x 4 foot CNC plasma table is designed to bring CNC cutting capabilities to garage enthusiasts, schools, or small fabrication shops. With a small footprint, the system brings CNC technology down to a size that will fit in most any environment. The system is compatible with most plasma cutters and the driver software will accept any .dxf file or G-code. With a cutting rate of up to 150 ipm and a resolution of approximately .0006 inch the Torchmate system delivers speed and accuracy previously available to only the largest fabrication shops. The included auto torch height control allows for the best quality cut and longest consumable life as it adjusts on the fly to your material. Simply add your plasma cutter and computer and start cutting! Torchmate also offers its CAD design software capable of laying out shapes for cutting and exporting the files to the driver software. A water table is available to trap dust and sparks created during the cutting process. Finally, the Torchmate system can also be used for more than just plasma cutting. Secondary tooling can be mounted for CNC routing, drilling, milling, and even engraving.